+Unit is extremely trained in hand to hand combat and firearms. -EMP blast can disable electronics in the helmet. 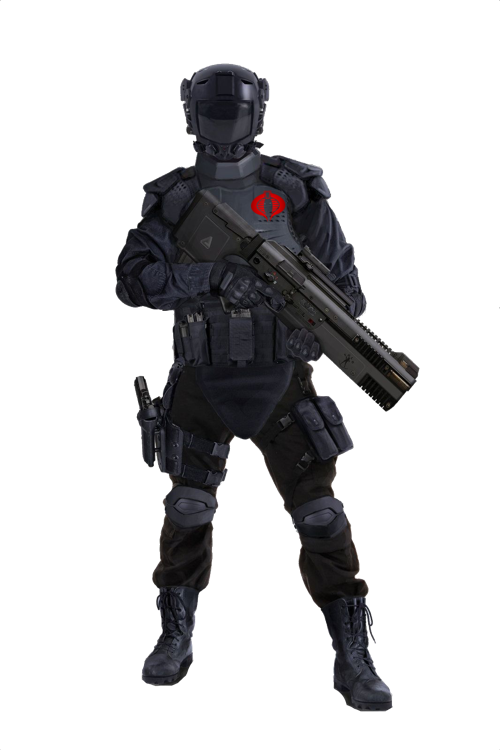 * Description: The Cobra Commandos are the back bone of the Imperial Cobra Organization. They have black tactical armor made with Tri prismatic polymer, also laced with fibers of Durasteel. Their black BDU's are made with Armorweave. Their armor is extremely resistant to blaster fire, but only offer average protection against lightsabers. They have tactical belts that hold a medpac, grenades, and rations. They as well have a tactical leg holster holding their Westar 35 Blaster Pistol. Their helmet has a fully functional HUD system, with a respirator to filter out all toxins and gases, with a comlink and thermal and night visions, and microbinocular capabilities in their HUD. The unit goes through a rigerous boot camp training regime where they learn numerous styles of hand to hand combat, and learn to master firearms. Edited by Cobra, 10 October 2018 - 06:20 AM. Writing "custom tactical armor" is perfectly fine for some of the more basic things, but when you describe that this armor makes them immune to toxins and gasses along with the rest of the descriptions and focus of strengths on it, I'm going to have to ask you to sub this armor to the factory first. Alternatively, you can pick a different armor from canon or swap the current one for a more basic version. These weaknesses all have to do with what the unit is wearing. A swap of gear could easily change these all around. I need at least one weakness please that has the potential to affect the unit in a PvP situations. Cobra Please use a name other than "Cobra" for this unit's name, as all of the information put together + the name makes it much too close to actual GI Joe. Edited by Scherezade deWinter, 12 October 2018 - 02:34 PM. Venom should you wish to have this un-archived in the future please contact a Codex RPJ or Admin, or alternatively, make a request in the Codex Discussion forum.